A cleaning product commonly used for retainers and dentures alike. 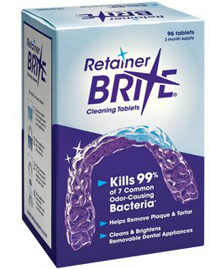 Great for increasing one’s oral hygiene by keeping dentures and retainers free of dirt and bacterial build up. Used daily it helps keep one’s devices fresh and clean.